Another character centred music video for Farscape. Zhaan with the music of Enya. Also shown at Creation Entertainment conventi Another character centred music video for Farscape. Zhaan with the music of Enya. Also shown at Creation Entertainment conventions. My music video on Chiana in Farscape. Shown at some of the conventions. Won some awards. 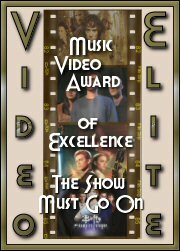 Music is Queen's: The Show Must Go On My music video on Chiana in Farscape. Alien 3 to the music of Mozart's Requiem. A short piece on some of the religious themes. Second music vid - first of mine to use DVD content.